Near Kasara Bazar School, Indore – 452 009. We find from various communications of IBA and UFBU that negotiations between Unions and IBA for next wage settlement have since commenced and a few rounds of initial discussions have already taken place from May, 2017 onwards. IBA has also taken steps to constitute negotiation committee and two sub committees to discuss, consider and negotiate the various demands included in Charter of Demands submitted by constituents of UFBU. We find that the Charter of Demands of UFBU constituents also include demands related to superannuation benefits and related to existing pensioners. 2. 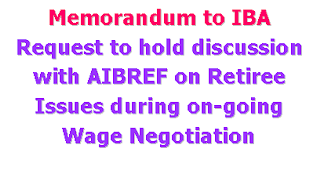 Further, AIBRF and other apex level retiree organisations as independent bodies representing about 4 lakh bank retirees have also submitted their Charter of Demands on pending issues of retirees for the discussion and consideration of IBA/ Bank Managements during the on-going negotiations for the next wage settlement. 3. So far, despite repeated representations from retiree organisations during the last wage settlement and also during earlier one, IBA has not come out with any set up to hold discussion with the retirees and it is seen that settlements on retiree issues are being finalised without taking their views in to consideration. Of late, IBA has advised us that it is voluntary organisation and render its services based on mandate received from its member banks. At present, IBA does not have mandate to hold discussion with the retirees. Therefore it is unable to consider the request of AIBRF in this regard. 4. We feel this is purely technical position. But the consequence of this stand is that important views of retiree organisations representing lakhs of retirees to whom wage settlements also affect remain unconsidered. You will kindly appreciate IBA as a professional body advising member banks on HR issues and negotiating on their behalf should consider the whole matter in larger prospective and suitably advice member banks, to obtain required Mandate from them to discuss retiree issues with the representatives of retirees. We feel that discussion with the retirees will have all advantages with no adverse point for IBA/ Bank Managements. 5. When we see history of bipartite mechanism which has completed 50 years of its existence , we find that it has worked quite well and effectively to decide service conditions of lakhs of bank employees. With initial reservation of bank managements about its effectiveness and because of continuous struggle of bank unions, it was accepted and adopted to determine service conditions not only by public sector banks but many private sector banks and foreign banks. We find that this mechanism has been able to deliver desired results and that there has been no occasion to look back in last 50 years on this count. On the contrary, officer staff whose service conditions were not determined by bipartite mechanism during the initial years also demanded and fought for it and finally achieved it. IBA as professional body found a new method of negotiating with officer staff who are not covered by IDA and introduced concept of “ Joint Note”. We find that this has also been working well. 6. As we all know that pension scheme which is in operation at present in the banking industry is also product of negotiated settlement arrived between unions and IBA in 1993. Many modifications, amendments and changes have also been brought in the original pension scheme through negotiations and settlements on them during last 22 years to meet requirement of changing time. During the above period, as you know new class of pensioners have emerged numbering in lakhs and directly affected with the decisions taken on pension related issues. They have their own logical views on the pension related issues which they wish to present through their organisations for better negotiated settlement. At present they do not have representation in the discussion on pension related issues at the industry level. Having accepted bipartite mechanism as principal tool to determine and deal with service conditions of bank employees including superannuation benefits and pension related issues by IBA/ Bank Managements and effectively and successfully using it, IBA/ Bank Managements should consider including retirees also part of the bipartite mechanism to enhance its acceptability in the changing environment rather than keeping it unconsidered on narrow technical grounds. 7. Today, as we all know many provisions of pension related settlements are under active scrutiny of courts. One of the reasons , according to us that the retirees are not being given representations in the negotiation process and on many occasions they are left with no option to knock doors of the courts in the absence of availability of forum for discussion for them at the industry level. This is not happy situation, either for the bank managements or organisations of retirees. We feel the whole issue of mandate and holding discussion with the retirees should be viewed under this larger prospective and some acceptable solution should be found immediately. 8. 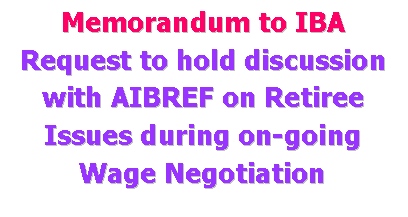 We may mention that Affiliates of AIBRF have recently submitted enclosed letters to the top managements of banks requesting them to consider our request of mandate and give required mandate to IBA for holding discussion with the retirees. During the interaction, in most of the cases management representatives are inclined to consider favourably. 9. During our interaction with leaders of UFBU cons tituents, they have also expressed their support on our this demand. 10. In view of the above facts we request IBA as professional body to take proactive steps to resolve this long pending issues before this also reaches door steps of courts.